Here are the 10 best moments from the recent Game Grumps charity stream. Yesterday, the Game Grumps Youtube group held a livestream marathon for the Crisis Text Line help service; a task that took about 8 hours. Aside from raising an impressive $155,330 for charity, the event also had a few comical or interesting moments. Now, we want you to share in that experience, like we did, but since 8 hours is a bit of a stretch for a lot of people, we’ll highlight the top 10 best moments from the Retro Give Grumps stream below. These examples are more in chronological order than in matter of importance, because everyone is a winner when you donate to charity. Mark Fischbach, the handsome, bright-haired, uber-popular Youtube star known as Markiplier, made a sizable appearance on the early hours of the stream and this man doesn’t mess around. After only sitting down for a few minutes, Mark commanded the camera to make a heartfelt plea, to stress the immediacy of donations. With almost 12 million subscribers, the Youtube star is no stranger to how charity drives work. Their golden heart and skill to engage an audience certainly helped bring in a lot of early pledges. To keep a long stream interesting, charity runs often introduce wacky antics. In this case, a wheel of punishment threw out random objectives. A particularly popular spin was for the victim to call their mom and embarrass themselves live on air. In one case, however, the viewers also received the same heartfelt talk from Momiplier, as they did from Mark earlier. It’s not exactly embarrassing when your mother teaches your on-looking crowd to become a better person in life. Not even joking around could really break mom’s kind nature. What a nice, little intimate moment. Mark and mom having a chat. Before even coming into the event, Markiplier had been too kind. Their donation of $5000 was left pending, because PayPal suspected no one could be this nice and give that much money early on. Later on, the efficiency of aforementioned Mark’s words and the consistent push for pledges eventually broke the donation site altogether. Quite ironically, destroying the very means of support you helped to set up is sort of the opposite effect you want to have. Even being a living saint has some slight disadvantages. Anytime we see rich and famous people complain, we roll our eyes. Surely, all this money and success must be a dream come true. That’s, however, because it’s hard for us to have a firsthand experience of how fame treats a person. On the stream, we got a rare glimpse behind the curtains. As the prize for one of the money goals, Markiplier opened their Direct Messages to everyone on Twitter. The result is incredible; just an avalanche of messages. It never ends and texts come in at such a rate, you couldn’t even read all of them if you spent just one second on each. That’s fame, but all the time. We have no idea. A mere second of Markiplier's messages. A lot of these instances are Markiplier-related, so we’ll cap it off here. As one of their last feats, Mark and Arin from Game Grumps called out to viewers to donate as much as they could in just five minutes time. The result of that action is rather overwhelming: $11,136.48, a result so big that it gouges Arin’s eyes out. Mark, being a much larger entity and having fewer company costs, can make that number work, but for the Game Grumps founder, just five minutes result in them, jokingly, “taking out a second mortgage.” That’s the power of a good drive. Stars need to be careful with their finances, too, but the excess is for a good cause here. A popular charity stream is usually inhabited by one or two power donators. This one was as well, but where everyone expected giant internet personalities to take the lead, the Retro Give Grumps show had another sort of champion. For almost three hours of the stream, a visual designer by the name of CuriouslilTT kept pouring in more and more funds. Eventually, their top donation came in at over $5000, an unreal amount of kindness from an unexpected avenue. That sort of dedication is commendable by itself. The punishment wheel hit some more than others. For Alex Faciane of Youtube’s TheNationalDex and part of the Super Beard Bros, it involved barely sitting down and immediately being fed an amount of mayonnaise, straight from the jar, which could probably kill a person. Rather than complaining and stalling, however, Alex toughened up and swallowed each giant spoonful with whatever confidence one can muster when having to, basically, eat a giant slab of fat. Everyone does their part to bring in money, but that’s impressive. Going back to huge stars, it probably doesn’t get bigger than Daddy Warbucks himself, Markus “Notch” Persson of Minecraft fame, dropping by. After first making a stealthy appearance in the chat, Notch proceeded to casually give $2000 in donations. A mere minute later, the retired game developer gone jet-set doubled up and plopped another $2000 out of the blue. Admittedly, it’s an affordable expense for someone of their stature, but it’s still both incredibly spontaneous and generous to hand out so much for charity. It would’ve even shown up on the screen, were it not for the amazing community outbidding a giant. Having great guests on air is one thing, but it takes a special person to go the extra mile and actually start “working” the stream. Jirard, also of the Super Beard Bros, didn’t just hang and joke around; they made sure that you, the viewer, got personal and immediate feedback. Throughout Jirard’s stay, the chat received numerous shout-outs and responses, something that’s no easy feat when your event is larger than League of Legends. Jirard cares, though, about you. What a hero. Something probably no one knew before the Retro Give Grumps show started was that Twitch has some restraints around sexually charged content, which can come up in unusual ways. 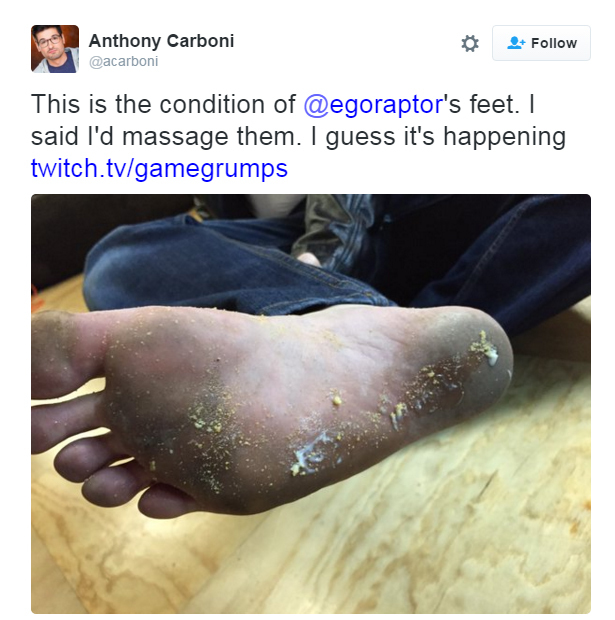 Before Anthony Carboni’s punishment started, which involved massaging Arin’s terribly gross feet, the stream received a direct message that they wouldn’t be able to show this on air. Apparently, Twitch doesn’t want to cater to foot fetishists and so, the stream had to shy away from showing a man rub another man’s foot. After seeing a graphic picture of the foot in question, however, maybe that’s for the best. Still; never would’ve guessed. Of course, you can still catch the full 8 hours stream and see for yourself. It’s a pretty relaxed time to hop into during the day. That’s the appeal of live events like this; it’s just a nice place to hang out with people you like. If possible, you can also still donate to Crisis Text Line and help someone in need. Their service gives people a direct line without having to call. Instead, people dealing with depression, bullying, abuse and other issues can just text a message and get a response from a specifically trained operator. For people with anxiety, for instance, this provides a much lower barrier to having to verbalize a situation. Thank you in advance.